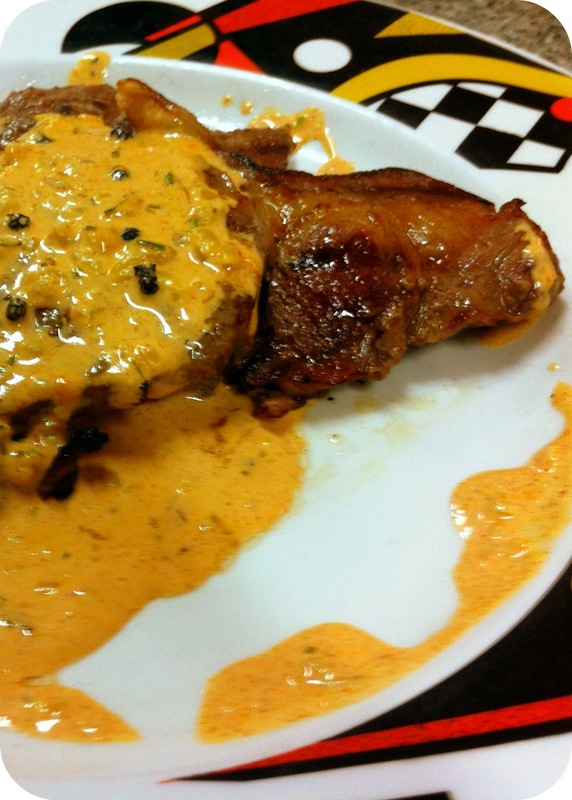 Do you always order the same old sauces with your steak? There's pepper sauce, cheese sauce, mushroom sauce or, if you live in South Africa, good old Monkeygland Sauce. Or if you are entertaining friends at home, it seems to be en vogue to make a kind of blue cheese butter and put a dollop of that on your steak. 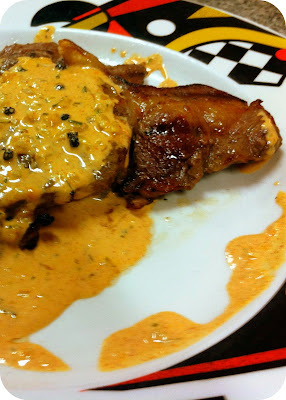 I love my steak and sauces as much as the next guy, but I feel that all these sauces and butters are hiding the taste of the steak. We don't need to go without a sauce though because this Paprika Sauce compliments the taste of a nice juicy steak. It is truly a match made in heaven. 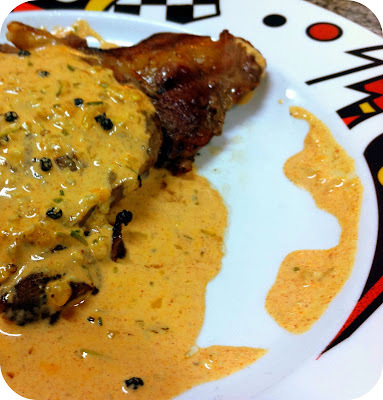 Before you say that you don't like anything spicy, let me put your mind at ease: the paprika used in this sauce isn't spicy at all, but it does have wonderfully rich flavour that compliments the taste of your grilled steak. It also contains some pine nuts which can be substituted with walnuts. The crushed nuts help with the thickening of the sauce and the oil it releases are also good carriers of flavour. Bash up the pine nuts and coarse salt in a mortar and pestle until just broken up. You can also do this with a table fork, if you want to. Pour the cream into a small saucepan. Add the saffron (if using) and gently swirl it around in the cream, until it is moist. Transfer the saucepan to the stove and gently heat the cream, without boiling it, stirring continuously. Now add the pine nuts and salt mixture and keep stirring. You will see some of the oil from the nuts being released on top of the cream. Next add all the herbs and the pepper corns and keep stirring the sauce gently. The colour of the sauce should now be turning into a beautiful orange from the paprika and the saffron. Remove the saucepan from the heat after about 2 minutes and allow the sauce to "rest" so that all the flavours can intermingle and develop. Use this time to quickly cook your steaks on the barbecue or in a griddle pan. All the meat needs is some olive oil to marinate in for a few minutes. No salt or spices. Once your steak is done, allow it to rest (this is essential) for a few minutes. While it is resting, put your sauce back on the heat. You will notice that it has thickened slightly during it's rest. Add the Parmesan cheese and heat through. Spoon some of the sauce over your well rested steaks (you don't want it to drown in the sauce) and wait for the compliments to roll in! I have to thank Chef Tyrone of Tyrone's Kitchen for teaching me this heavenly sauce! Please check out his Facebook page. Well you had me on the color of that sauce and when I read the recipe, I saw the pine nuts that thickens the sauce and my heart bounced with excitement. Wow, this is a great sauce!! Thanks for the visit, Nina! Yep, I really like it too. It just "works"! This is inspired, I LOVE paprika, and have had some saffron lying around that i don't know what to do with!